Struthio cucullatus Linne, 1758, Mauritius (the name Didus ineptus Linne, 1766, used in older literature). French: Dronte de Mourice; German: Dronte; Spanish: Dronte de Mauricio. PHYSICAL CHARACTERISTICS Large turkey-like bird. Contemporary paintings of this species, based on live birds or traveler’s descriptions, show grayish plumage, darker above and lighter below, yellowish white wings with five to six larger feathers, and a tail with five curled feathers. The hooked bill was deep yellow with a horny sheath on the upper and lower mandibles. The skin on the face and around the bill was dull gray and bare of feathers. Mauritius, a small (720 mi2; 1,865 km2) volcanic island about 500 mi (800 km) east of Madagascar in the Indian Ocean. Dodos reportedly ate fruit. Dodos swallowed stones apparently to aid the breakdown of food in the crop. This species apparently had a seasonal fat cycle. 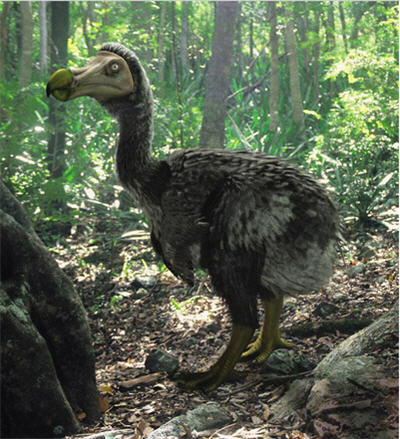 A possible mutualistic relationship existed between dodos and the tambalacoque tree, with passage of the tree’s seed through the dodo’s gut promoting the seed’s germination. Dodos nested on the ground and laid a one-egg clutch. The egg was described by Franзois Cauche in 1651 as being the same size as a half-penny roll. Cauche used this same comparison for the egg of the great white pelican (Pelecanus onocrotalus), which has a 6.3 oz (180 g) egg. The general relationship between egg mass and incubation period suggests that the dodo’s incubation period was about 37 days. Extinct. The Mascarene Islands had been known to Arab navigators prior to European contact but nothing of their exploration of these islands is known other than the appearance of the islands on their maps. For Europeans, the existence of Mauritius was first recorded in 1507 by Portugese sailors, and until 1598 it remained uninhabited except for pigs, goats, and fowl that were stocked on the island. 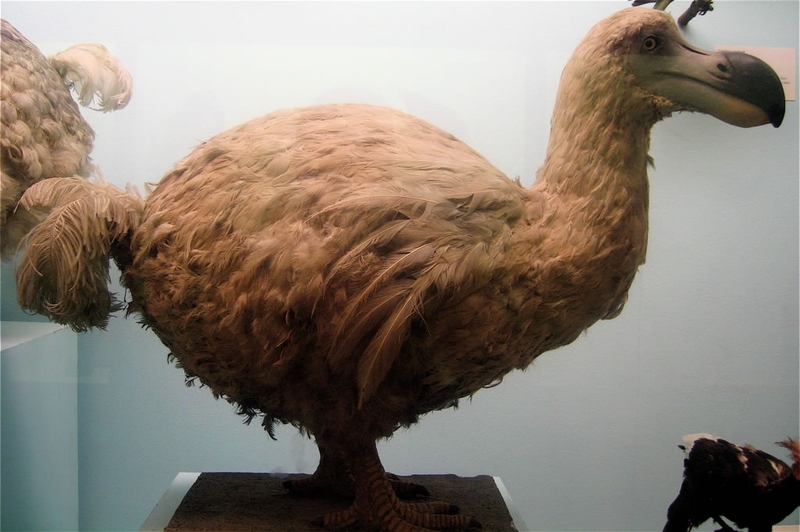 The primary cause of extinction of the dodo is likely to have been egg predation by introduced pigs, monkeys, and cats, even though dodos were slaughtered in large numbers by sailors. 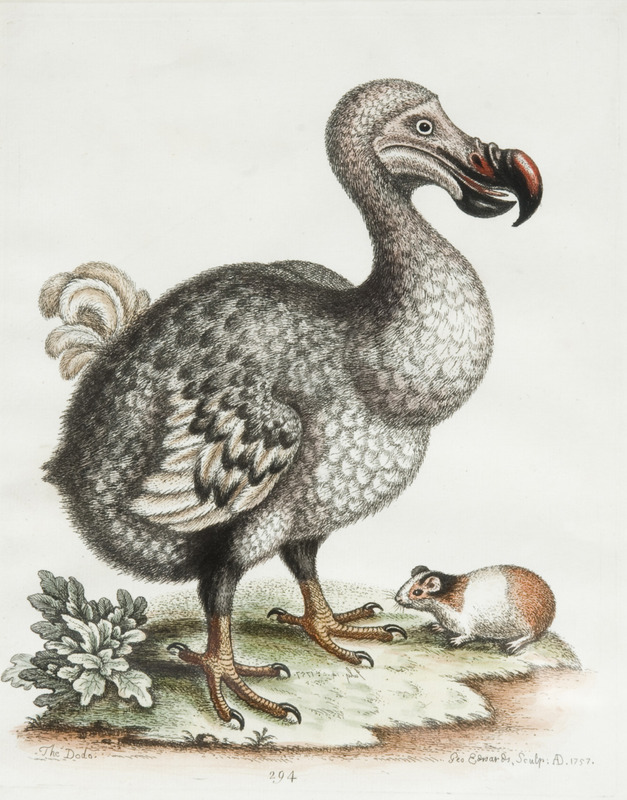 Dodos were very rare by 1640, although some survived to 1662, at least, on offshore islets. 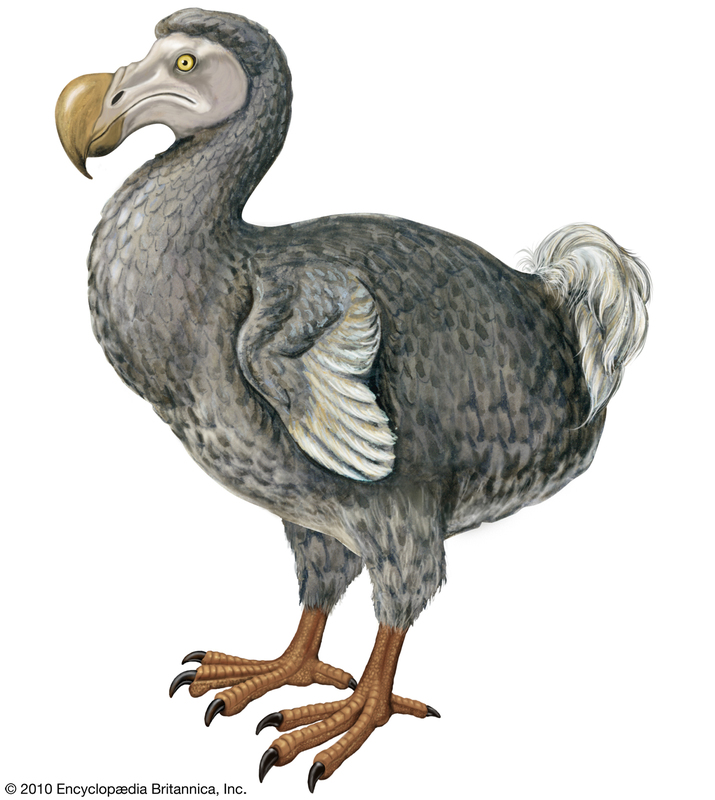 The last sighting of a dodo was recorded somewhere between 1665 and 1670, but it is an unconfirmed report. Dodos were a source of fresh meat for crews and passengers of ships traveling in the Indian Ocean. 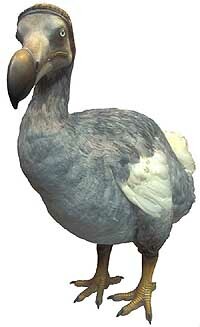 The dodo is the first species to be counted as becoming extinct because of human activity.